I was cold, muddy, sweaty, and exhausted when I walked into The Bellingham Herald’s newsroom. My feet were soaked, my pants from my knees to my boots slathered in mud, and every bone in my body ached. It was a good day. A very good day. Shooting the Ski to Sea endurance race with hugely satisfying. 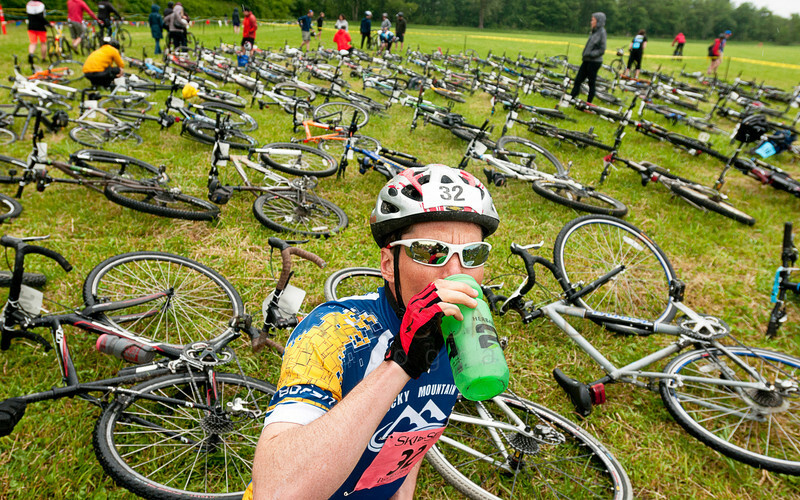 © Paul Conrad/The Bellingham Herald – Ian Murray of Canmore, Alberta, hydrates before the start of the mountain biking leg of the 2014 Ski to Sea Race on Sunday afternoon May 25, 2014 in Ferndale, Wash. It began about 10ish when I arrive at Hovender Homestead Park in Ferndale. My job is to cover the sixth leg, cross-country biking, of the race. I was so early, only volunteers and a few hardy racers were there. Although the race was officially underway, there was an expected wait of nearly two hours before even the fastest racers would arrive. © Paul Conrad/The Bellingham Herald – Josh Poulsen with Brown Dog Bikes of Bellingham adjusts the front derailleur of a bike while giving courtesy inspections during the mountain biking leg of the 2014 Ski to Sea Race on Sunday afternoon May 25, 2014 in Ferndale, Wash. While waiting, I chatted with race officials and volunteers. One of the topics of conversations was how high the river is. Usually, the canoers had at least 100 yards of a sandbar to land on for the exchange to take place. However, this year the landing spot was less than 10 yards of shoreline which would make it a tough challenge when more than two or three canoes arrived at one time. 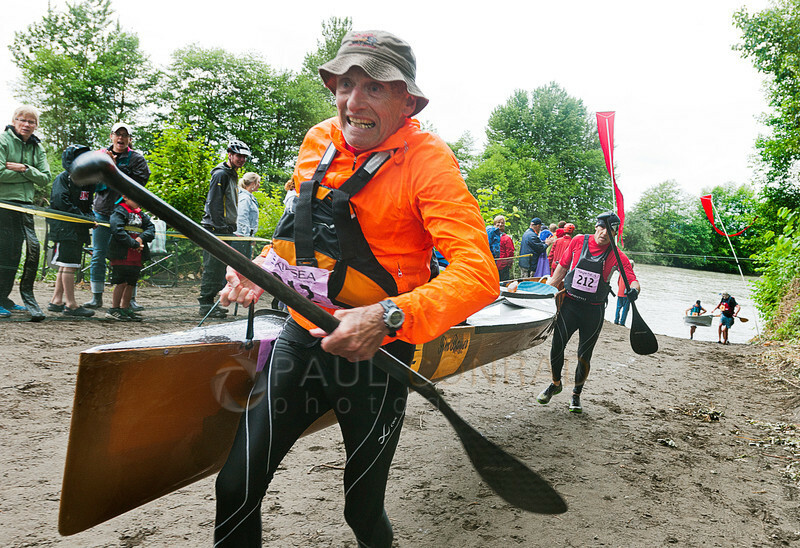 © Paul Conrad/The Bellingham Herald – Nick Bauer and Jim Bauer carry their canoe out of the Nooksack River to begin the cross-country biking leg of the 2014 Ski to Sea Race on Sunday afternoon May 25, 2014 in Ferndale, Wash.
© Paul Conrad/The Bellingham Herald – Larson Loeb of OOO-UM-GOW-AH flies over his handlebars as he attempts to ride over obstacles at Hovender Park during the mountain biking leg of the 2014 Ski to Sea Race on Sunday afternoon May 25, 2014 in Ferndale, Wash.
© Paul Conrad/The Bellingham Herald – “Boats & Hose” team members Collin Murphy and Andy Millard paddle towards the end of the canoe leg of the 2014 Ski to Sea Race on Sunday, May 25, 2014 in Ferndale, Wash. So, I arrived early. While there talked with people and figured out what was going on. Shot what I could of the begging leg of this segment. 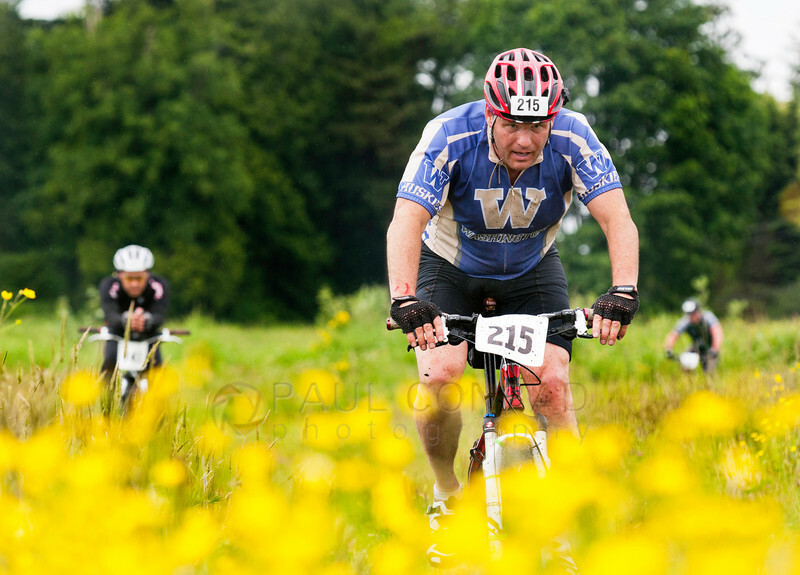 © Paul Conrad/The Bellingham – Dan Garrison of “Team Mandelbaums” traverses on open field along Labounty Road in the mountain biking leg of the 2014 Ski to Sea Race on Sunday afternoon May 25, 2014, outside of Ferndale, Wash.
After half an hour of that, I went to Squalicum Park. Unfortunately, the winding trails usually ridden by the bikers were closed due to construction of new baseball/softball diamonds. But I was able to find a corner they came around at a pretty good speed, so as they rode past me, I used panning to capture that sense of speed. © Paul Conrad/The Bellingham Herald – Stephanie Ludlow with the team “Anteverted Hipsters” screams around a corner in Squalicum Park during the mountain biking leg of the 2014 Ski to Sea Race on Sunday afternoon May 25, 2014, in Bellingham, Wash.
Panning takes a bit of practice, but it’s easy to do. First, plant your feet parallel of the direction of travel that your subject is going. 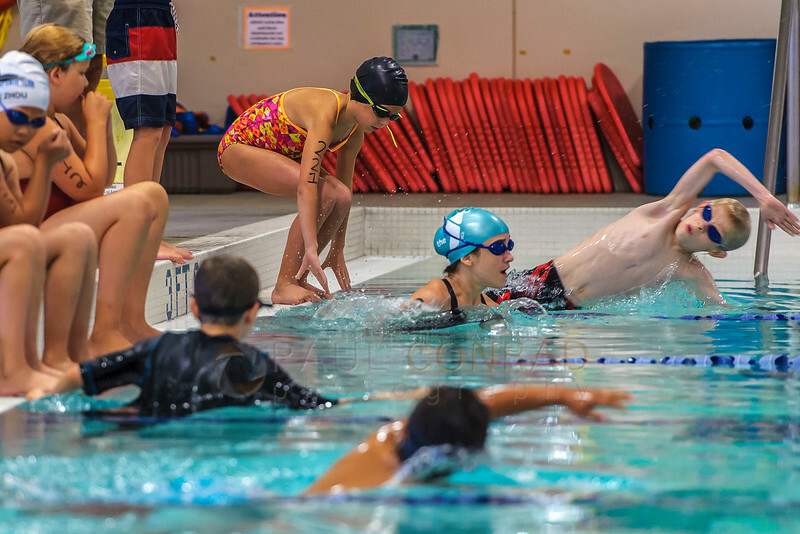 Next, use a slow shutter speed and tiny aperture. The key is you want the subject sharp with the background/foreground blurred. You begin following your subject and then when the subject is almost directly in front of you, begin firing off a few frames. The reason you wait is so you can center your subject in the frame and judge its speed better so you get a good image. After leaving the park, I was driving along Squalicum Parkway and noticed the bikers riding an abandoned set of railroad tracks. As there was nowhere I could park, I drove slow to see if I could find a trail that led to them. © Paul Conrad/The Bellingham Herald – Kevin Bowman, right, with “676-GARY” crests a hill as Emily Hirsch-Burdick with “SFH-GET TO DA DOCTAA!” begins her climb along Squalicum Parkway during the mountain biking leg of the 2014 Ski to Sea Race on Sunday afternoon May 25, 2014, in Bellingham, Wash.
At the end, I noticed the bikers coming up a small hill pushing their bikes. I parked just before that spot and checked it out. I then went to check it out and noticed the long tree tunnel the riders went through. ©Paul Conrad/The Bellingham Herald – Megan Struther with “Gates Of Hell,” right, rides past Christie Duque of “Ain’t No Mountain High Enough” as she carries her bike along Squalicum Parkway during the cross-country biking leg of the 2014 Ski to Sea Race on Sunday afternoon May 25, 2014 in Bellingham, Wash. Duque broke her chain riding the rough railroad tracks along the road. So I spent a few minutes shooting this beautiful composition of the bikers riding through this section of trail and then pushing their bikes up the muddy hill. While shooting it, I noticed one of the riders carrying her bike. Her chain came off the front sprocket due to the rough trail. It was an incredibly fun and satisfying day. Which probably explains why I was so tired at the end of the day. That or the 5 miles my pedometer says I walked. 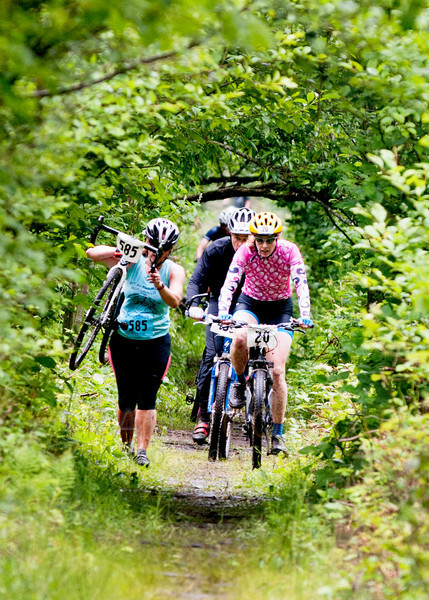 For more photos from this section of Ski to Sea, view this slide show on The Bellingham Herald website: Ski to Sea Cross-Country Biking.